I’ve picked litter in some strange places in my time. I’ve scrambled down banks at the entrance to the Blackwall Tunnel, trawled through the (shocking) contents of a yard behind a GP surgery and poked my picker through the bars of a fence separating a fish shop’s rubbish bins from the High Street. Nice. I found 5 kilos of onions once, a chandelier, a gold bar (sadly not real), house key, car key, monkey (toy) and; well you get my drift. Nothing can shock me now. Or so I thought. Until I boarded the very late 20.47 from Edinburgh to Kings Cross at York on 28th December. Must be on the wrong train I thought. 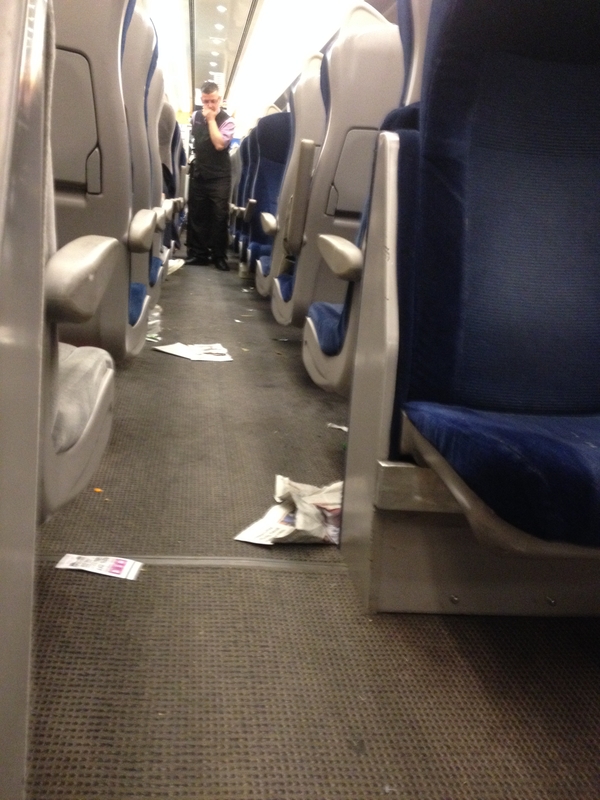 This is obviously the train transporting Scotland’s festive filth to England for reprocessing. And yet there are seats. I take one. But not before brushing off a pile – I mean a stack – of sandwich wrappers, Coke and Fanta bottles, crisp packets and newspapers. I pushed them onto the floor – it was covered in rubbish anyway – and I sat down. 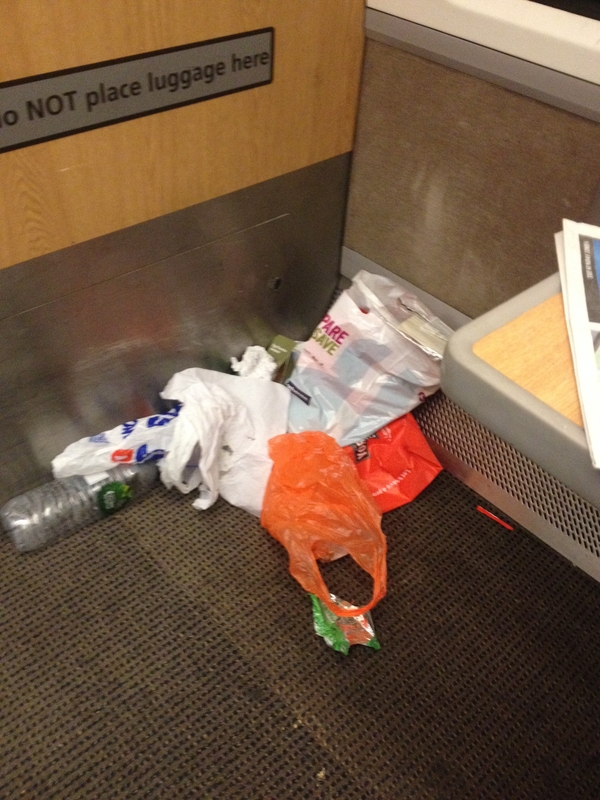 I looked at the rubbish and thought “Hmmmmm – 3 hours to Kings Cross – can I really sit in garbage class for 3 hours? No!”. I found the guard. 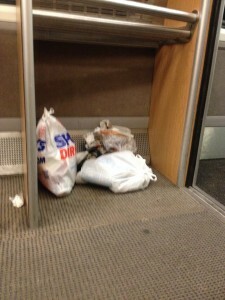 Can I have a bin bag please? Sorry – none on board. 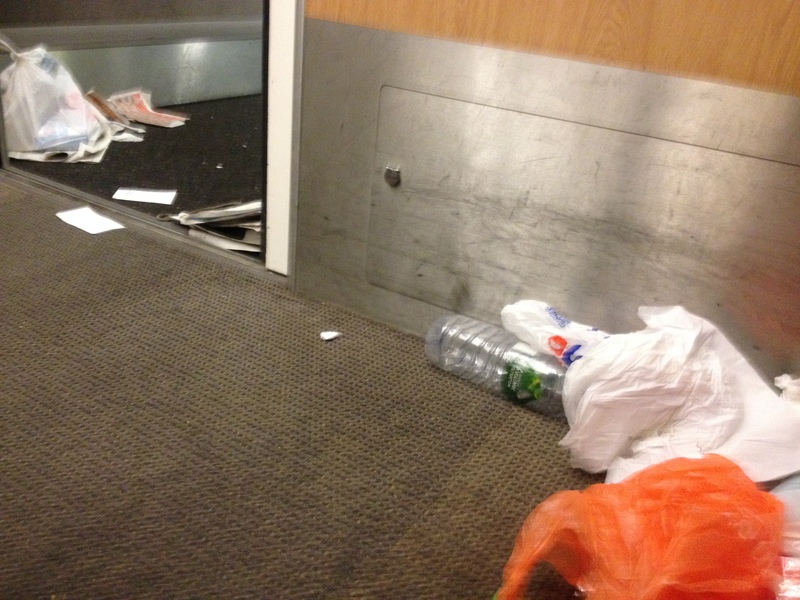 I improvised – one occasion when I was glad to find carrier bags on the floor. I started picking by hand (wearing my cycling gloves). I picked crusts not eaten, noodles spilled, drinks unfinished, newspapers used to wipe up the aforementioned noodles, half a sandwich, unwrapped (sadly), little milky carton thingies – full and empty, spoons, forks, a cuddly toy (not really – not this time). Nasty. And then to prove every cloud has a silver lining I found – yippee!!!!! – an unopened bag of Wotsits – grab bag size!!!! Why do I litter pick? I can’t help it. Something inside me maybe. Like the Wotsits – yummy!!!! This entry was posted on Wednesday, January 7th, 2015 at 2:29 pm	and is filed under all posts. You can follow any comments to this entry through the RSS 2.0 feed. You can leave a comment, or trackback from your own site. Love it ! So often I have thought, I want to deal with that , and you felt the fear (perhaps) and did it anyway.How crazy for no bin bags on board the train. I picked up 205 bags last year, 256 bags in 3 months this year. All of it from main roads, car parks and lay byes. The biggest volume, and concern, is the amount of alcoholic drink cans and bottles thrown out of vehicle windows. One has to wonder as to the state of the drivers and whether the ‘evidence’ is disposed of before/in case they get pulled in my the police. The off license Bill legalising 24 hr availability of alcohol is the main cause, and one can only wonder at the logic of the MP’s who past it. On the other hand, a look at the House of Commons drinks bill could explain that.